It has been a brutal and horrifying week for victims of sexual assault. For those that were even able to stomach sitting through the KavaNOPE hearings they saw first hand what this nominee is all about, make the victim the criminal and the criminal the victim. Join us for the People's Motorcade, 9:30-10:30, followed by our weekly rally in the Free Speech Zone. MEETUP IN BEDMINSTER ONLY. The meetup in Branchburg has been stopped until further notice. Please let others know. We will be meeting at Clarence Dillon Library, Bedminster Township. 2336 Lamington Road. Meetup 9:30 depart at 10:00. 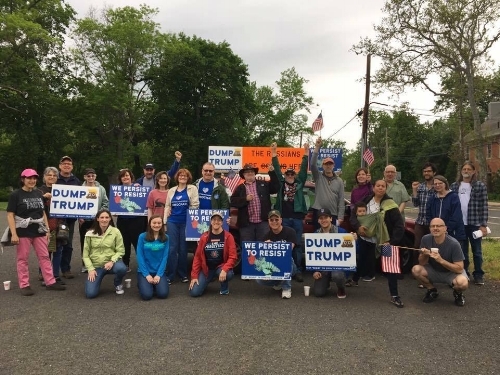 This week's Motorcade will be led by Gail O. and Lisa K.
We will gather to dress our cars and then do a looping motorcade in front of Trump National Golf Course in Bedminster. Weather and will permitting, we will then rally at the Free Speech Zone at Clarence Dillon Public Library. More about the People's Motorcade at www.peoplesmotorcade.com.